The weight loss balloon is a form of weight loss treatment that does not require surgery. A soft, durable balloon is inserted through the mouth into the stomach in a simple, 30-minute procedure under sedation. This translates to no recovery time and no scarring since there are no incisions. The balloon is combined with a 12-month diet and exercise plan to ensure patients maintain their results. On average, patients with the balloon lose three times the weight they do with diet and exercise alone. The weight loss balloon program utilizes a team approach. Your physician, dietitian and exercise physiologist work together to guide you through the process of developing a customized diet & exercise program that supports you in making healthy lifestyle choices. A soft, durable balloon is inserted and filled through the mouth into the patient’s stomach in a simple, 30-minute procedure under sedation. Most patients go home a few hours after the procedure. The balloon takes up space in the stomach for six months, which helps patients eat smaller meals. After six months, the balloon is removed during a simple procedure. The balloon is combined with a comprehensive, twelve-month diet and exercise plan. Is the weight loss balloon covered by insurance? No, the weight loss balloon is not currently covered by insurance. 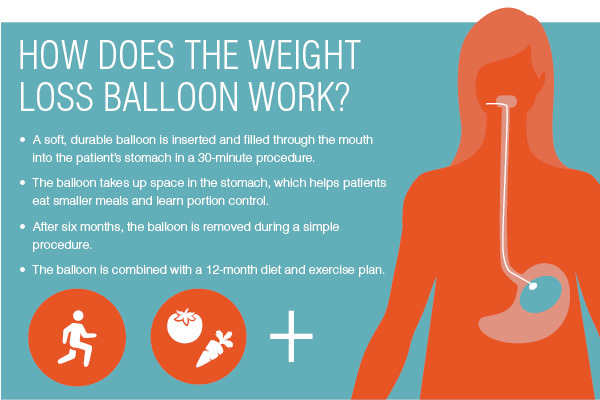 What is a weight loss balloon? 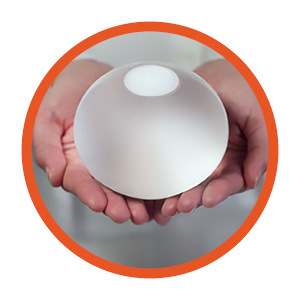 A weight loss balloon is a non-surgical and short-term (temporary) weight loss device. A smooth, soft saline-filled balloon (about the size of an grapefruit) is placed in your stomach, allowing you to control your portion sizes by filling space in your stomach. By following professional health and wellness advice, you can adopt good healthy eating habits and change your lifestyle so you can lose weight quickly and keep it off long term. Will I gain the weight back after removing the weight loss balloon? Published clinical studies have shown that - provided you keep to the prescribed diet and exercise regime - you will maintain weight loss through dieting post-removal. So, if you stick to your new, healthy lifestyle you will be well on the way to maintaining your weight loss. Are weight loss balloons safe? Weight loss balloons have been used in the management of obesity for over 20 years. Over this time they have evolved in shape, size, and design resulting in a modern, durable product, which is now well established as a safe weight loss procedure. Over 220,000 weight loss balloons have been placed worldwide. How do weight loss balloons help people lose weight? Once in place, the weight loss balloon is filled with saline to partially fill the stomach so that patients may consume smaller portions of food. Most weight is lost in the first three months, but because the weight loss balloon stays in for six months, you will learn the right amount of food to eat to maintain your new weight long-term. What are the possible side effects associated with the weight loss balloon? It is very likely that the presence of the balloon in the stomach will cause nausea or vomiting after placement. In some patients it may last one to two weeks. Your provider may prescribe medication to help minimize these potential effects. Patients should contact their provider immediately if they experience any severe or unusual symptoms. The most widely used measurement for obesity. The BMI approximates body mass using a mathematical ratio of weight and height [(weight in kg ÷ height in meters) or (weight in pounds ÷ height in inches x 703)]. A BMI of 30 or more is regarded by most health agencies as the threshold for obesity. A BMI of 40 or more generally qualifies as morbid obesity. However, note that BMI measurements in body-builders and athletes may not be accurate determinants of obesity because the BMI does not distinguish between muscle and fat. Yes, my BMI is between 30 and 40. No, my BMI is not between 30 and 40.